We’ve heard it all millennials– from being branded narcissistic and entitled to optimistic and innovative. Nonetheless, I was encouraged by Forbes Women Africa which recently featured a spread of diverse, African female millennial entrepreneurs. It was refreshing to see a positive narrative of young African women who are bringing fresh ideas to the continent and making their mark in the world. Aisha Pandor was one of the poised young women on the cover of this issue. Aisha is co-Founder and CEO of SweepSouth, an online home cleaning service platform established in 2014 which connects clients with Cleaners in minutes. Interestingly, just before the release of the Forbes cover, I had been over-thinking how to approach Aisha for an interview for weeks! Earlier in the year, I heard her being interviewed on the 702 Money Show. During the interview, she mentioned that her and her husband / co-Founder (Alen Ribic) had just secured R10m funding from the Vumela Fund for their business. So after hearing Aisha speak on the show and then reading her interview in Forbes, I knew I had to muster up the courage to ask her for an interview, and she very graciously accepted. Having seen glimpses over the years of Aisha pushing her business, I was highly impressed by her story, her energy and how her hard work was really starting to pay off. What I admire the most about Aisha is that she’s a maverick. How many times have you heard that there are no black women in the science and technology sector or that the informal sector is excluded from technological innovation? Instead of accepting the status quo, Aisha victoriously hacks the system and makes her own rules in casual millennial swag. And as a mom, she consciously hopes her approach leaves an impression on her daughter. In fact, talking to Aisha reminds me of the famous “Think Different” campaign by Apple that goes: “Here’s to the crazy ones. The rebels. The troublemakers. The ones who see things differently. While some may see them as the crazy ones, we see genius. Because the people who are crazy enough to think they can change the world, are the ones who do.” Here’s to Aisha R. Pandor. MR: Let’s first talk about your career pivots. So your academic background is in the Sciences and you have a PhD in Genetics. When you left university you decided to work in Management Consulting. After some time you then quit that to become an entrepreneur and started SweepSouth. What do you think has driven your career pivots and what do you think these decisions reveal about yourself? AP: My team and I have recently been doing strength finding exercises so that we can understand each other better as a team, and what I’ve found out about myself is that I’m very input and execution orientated. I enjoy working with data, analysing information and drawing on that information to make decisions and execute. This is why I enjoyed being in the Sciences and research, because I was able to take in information on how biology, our bodies and genetics works [input], and then develop gene therapies for people who were sick with genetic diseases [execution]. Research and execution was also a key theme in my Management Consulting experience. Now, at SweepSouth, I find myself really enjoying gathering information on what a happy home means for both our clients and our Cleaners, and what’s driving the domestic cleaning sector [input]. And then I use that data to tailor our service to our customers and run an effective business [execution]. So I’d say the consistent theme in my career pivots has been using good data to create a meaningful impact. MR: What is SweepSouth and what does it aims to achieve as a company? AP: SweepSouth is an online home cleaning service platform that’s all about creating happy homes. We aim to manage activities that people either don’t have the time, or expertise, or desire to do themselves in their homes. So whether you’re a busy mom, or a young professional, or you’re looking to provide services like cleaning, we have a platform to make it easy for you to create a happy home. In the future we want to provide a total home services solution, including plumbing, grocery shopping, nanny services etc. So we want to understand all our clients’ home needs well and cater to those needs. 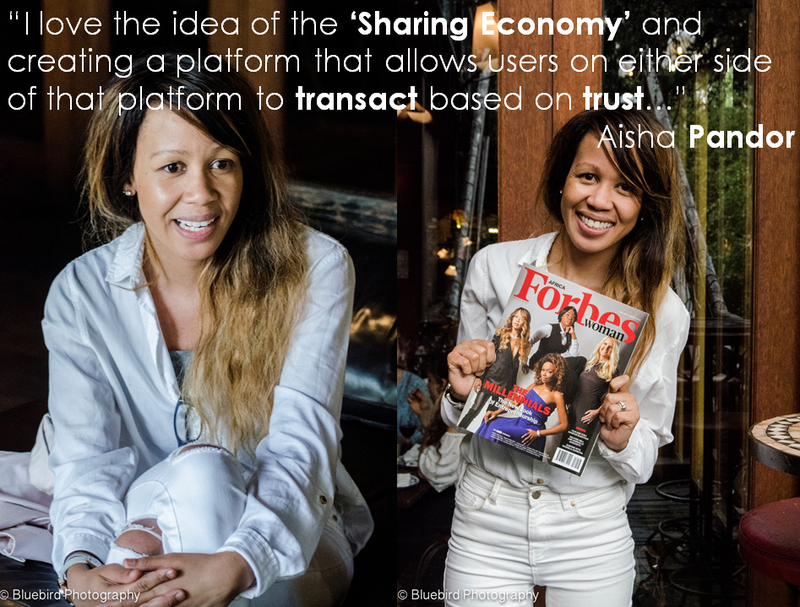 By the way, I love the idea of the “Sharing Economy” and creating a platform that allows users on either side of the platform to transact based on trust. Although that trust may be breached at times, that happens in life anyway. But, what the “Sharing Economy” ultimately allows is for someone to earn money providing a service by connecting them to someone else who is willing to pay someone an honest rate to receive a service. MR: The “Sharing Economy” is an exciting concept, but SA is a generally conservative society with a high crime rate and trust barriers. Do you think the local market is ripe enough for the “Sharing Economy” to flourish? AP: Yes, I think we’ll get there. We have a strong youth population, and even when we look at what millennials typically share on social media versus older generations, it’s very different. For older generations, the idea of posting a photo of themselves on the internet when they’ve just woken up in the morning or in the bathroom in front of the mirror wearing a bikini, is just bizarre [Laughs]. Yet young people do this all the time, despite the dangers of what could potentially happen to those photos. So there’s this level of trust that’s becoming more normal, and there’s certainly a part of society that’s embracing this new sharing world. For the majority of South Africans, I think the change to a sharing economy may be slower because we can be quite conservative. But, when people see the benefits of the services offered, they’ll come around. Johannesburg is actually one of Uber’s fastest growing markets internationally. Sure there may have been some initial distrust and there were incidents that Uber had to deal with, but people needed this convenience and got over it relatively quickly. We had similar initial trust issues with customers on SweepSouth- people had concerns about how they knew for sure someone would show up after they had given us their card details- and again customers got over that very quickly. MR: Now that you’re in the tech-startup game, and having not been in technology previously, how did you equip yourself with relevant skills you needed for your business? Did you learn how to code? AP: I did learn basic code, mainly so that I could understand what Alen was doing and so we could have intelligent conversations about what the platform needed to do. Other things I had to learn included financial modelling. Not financial modelling for a company that’s existed, but for a business that’s completely new where a lot of the modelling is predictive and based on a different set of assumptions. I spend a lot of time doing research online and because I have a strong research background I’m good at discerning information. We’ve also been through a few rounds of funding and what’s been exciting about this is when we’ve received funding from overseas that’s been through completely new funding vehicles in the South African context. For example, when we received funding from an overseas venture firm called 500 Startups they use a funding vehicle called a KISS (Keep It Simple Security). KISS funding uses convertible notes, which are a form of short-term debt that convert into equity, typically in conjunction with a future financing round / when the startup gets larger (more here). And so we had to figure out how to fit this into South African Company Law, with the help of our lawyers who were also working on this type of deal for the first time. As CEO, I’m responsible for protecting the company and our assets in conversations and negotiations with investors. So I’ve had to learn these skills quite quickly. MR: Please will you walk me through the process and time it took for you to identify this business opportunity, define the business model and then develop a technology solution? AP: It took us 4 or 5 months to go from concept design to building the platform to launching it, which is a short amount of time to build a platform from scratch. But we were so focused and we knew exactly what we wanted it to look like. Also both of us quit our jobs to do this full time, so we had to work quickly before we ran out of money. We launched a Minimal Viable Product (MVP), the basic concept which would allow a user to book a Cleaner end-to-end, and after that we continued building based on the feedback we received from friends and our clients. We would also conduct analysis on how users interacted on our site, i.e. what users were clicking on, what questions we were getting and whether that meant we needed to improve our UX or include questions in our FAQs. We also have a dual rating feedback system where clients rate Cleaners and Cleaners rate clients. We’ve been very attentive to our customers and pay a lot of attention to feedback. Looking back, there was absolutely no way we could’ve created as good a product in such a short time span while still working in corporate jobs. But I wouldn’t advise this for everyone. In fact, my parents were against the idea of us quitting our jobs, selling our house and cashing in our pension, while we have a child. My mom said to me: ”You have to have at least 3 years’ worth of savings before starting a business”. I responded “Mom, who in this day and age has 3 years’ worth of savings?” [Laughs]. They were very nervous, but in the end they knew that we would give this idea all that we had, and even if the idea failed we were still educated and employable. MR: What do you think ultimately made investors believe in your business and award you R10m funding? AP: Firstly, I think the most important success factor is having a strong founder team. Clashes between founders are a very common reason why startups fail, but Alen and I know each other very well. We also both understand the spheres in which we operate in well. Alen is a brilliant technician and I’ve been great with knowing the market and managing the operational and the people side. I also think we both have the potential to grow this into something really big. A lot of startup founders have great ideas, but aren’t able to scale up their business. Secondly, we gained a lot of traction over a short period of time. We’d only been around (launched) for a few months when we first engaged investors, but we were able to show that within that year as a small team of two, there wasn’t a single month that we had less growth than the month before, even though at times we had been out of the country. Lastly, the idea itself is something we are passionate about and is relevant to South Africa because we’re creating work opportunities for people very quickly, which has resonated with the objectives of our investors. If you have a successful interview with SweepSouth, you get on-boarded very quickly on the system and in less than 24 hours you’re able to get bookings. So there’s a very quick turnaround for Cleaners to start working and earning money. MR: You’ve given some insight on what it’s like working with your husband, Alen. Some people are quite cautious about starting a business with their spouse or partner. What has your overall experience been like pursuing entrepreneurship with your husband? AP: We went into business together because we have complementary skills and because we were both over working for other people. Fortunately, I love working with my husband. I think the fact that we have complementary skills, we have a shared dream for our business and we were able to pool our resources together into this project were key success factors. If we were both developers or if we were each working on different business ventures, I don’t think things would’ve worked out the same. But, when you’re in a relationship with your business partner, there is the risk that working together will affect your personal relationship negatively and starting SweepSouth was a scary decision for us as a family. Our daughter was 3 years old when we launched the business so we had to be okay with the possibility of not being able to pay for her school fees sometimes and we saw how selling our house was quite distressing for her. For anyone considering pursuing an entrepreneurial venture with their partner, it’s a hard decision, there’s a lot at stake and it’s definitely not something to be taken lightly. MR: What are the challenges that you are most proud to have overcome in your journey so far as an entrepreneur? AP: Having a child who is so well grounded, is something I am very proud of. Our daughter is quite mature for a 6 year-old and understands that there’s something bigger that we’re trying to achieve. She was around during the days when we didn’t have an office and there were queues of people standing outside our home wanting to apply to SweepSouth. She understood that those people were looking for work and needed help accessing opportunities. I’m very proud that my daughter has seen me build something from scratch, first-hand and very early on in the journey. Hopefully one day we can look back with her and remember the day we sold our house and we were in tears driving away from it, but we did this because we knew we were moving on to something bigger. 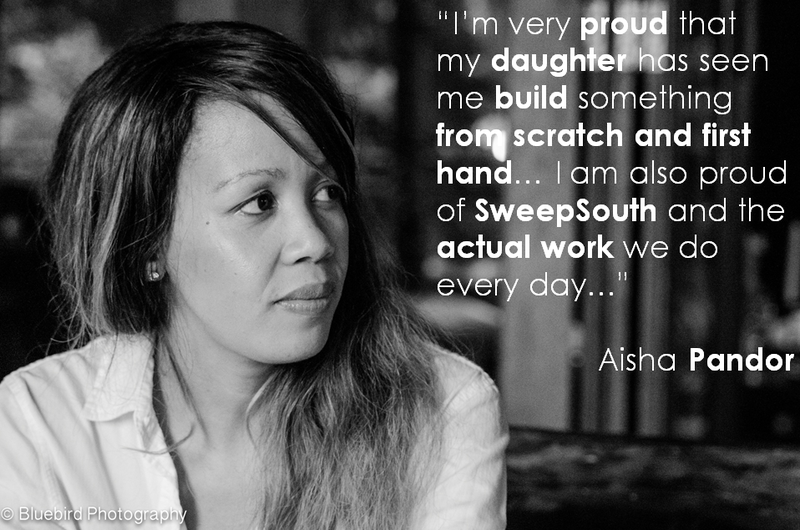 I’m also really proud of building SweepSouth and the actual work we do every day with our amazing team. No matter what happens to SweepSouth, I’m proud to say that Alen and I did this. We went from just two women who were on the platform in the first month, to having hundreds. Now we’re able to pay out hundreds of thousands worth of salaries in per month, which means there are people and families who are actually benefiting from our platform, the work we do every day and having access to work opportunities. 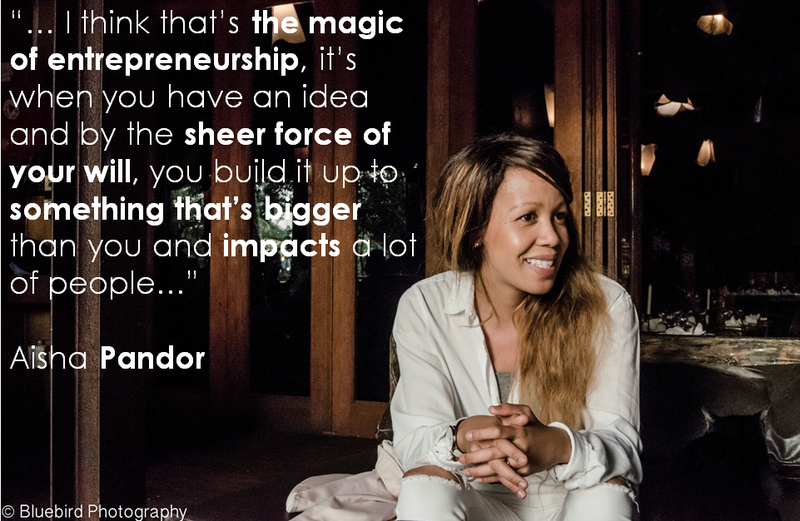 I think that’s the magic of entrepreneurship, it’s when you have an idea and by the sheer force of your will, you build it up to something that’s bigger than you and impacts a lot of people. MR: On that inspiring note, what closing advice would you give an entrepreneur? AP: Firstly, being very focused and precise with what you want to do is important, especially when you are doing well, because that’s when you can easily get distracted and veer off into a different direction altogether. Secondly, have a good business partner, because it’s an extremely hard journey. If you’re starting a business from scratch there will be really bad times and your self-worth will be challenged. I’ve found that having a support system outside of the business isn’t really enough to get you through the emotional journey. You need to have a business partner who understands the challenges and can keep you motivated. Thirdly, be passionate about something that’s beyond the money and the egotistical side of business. So make sure you have a vision and a mission that’s meaningful, because that’s what becomes the “why” which you have to fall back on when the “what” becomes really hard. Roughly this time last year, Mbewu Movement founding members had dinner with Joyce Kim, co-Founder and Executive Director of Stellar, a fin-tech company based in Silicon Valley. A piece of wisdom that Joyce shared with us was to “discover the things that you do that make you proud as hell”. Having met both women, there are many things that I think Joyce and Aisha have in common, one of them being that they both leave you with the feeling that YOU can actually change the world. I’m sure many #youngpreneurs, side-husslers, working mothers and power couples are inspired by Aisha’s incredible story. Most importantly, always remember to think different.